Greetings Pastors, Ministers, and Members of the Southwestern Diocese: Praise GOD for his goodness and his wonderful works to the children of man! Our National theme for the year is “Better Together: United We GROW”. This will also be the focus of our Diocese Mission Rally & Music Worship for dates listed above. We will discuss how to grow our membership and congregations through: Inspired WORSHIP, the Insightful WORD, and Intentional WITNESSING. Please plan to attend and be energized for a year of personal blessings and kingdom growth. 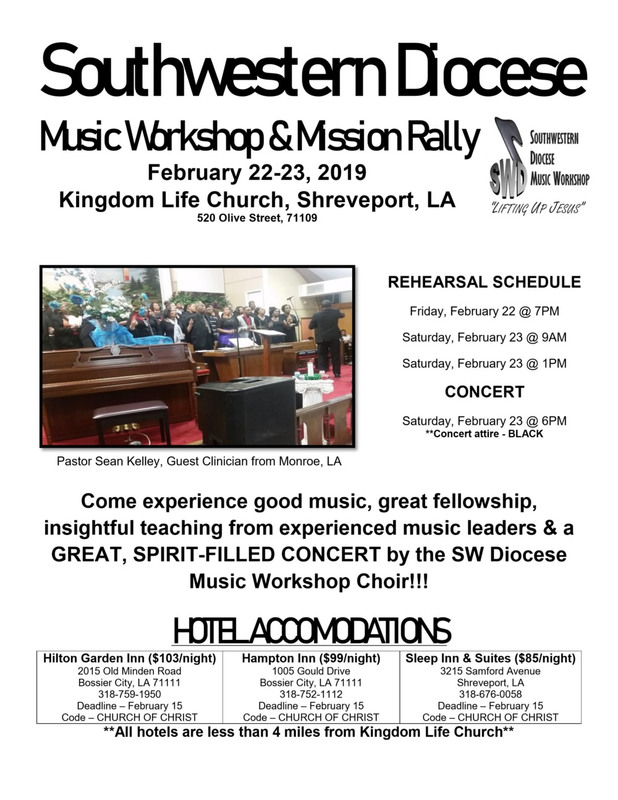 Please see the attached for addition information on the Music Workshop and lodging accommodations.